For the past five years, VSI Labs has worked with a wide array of autonomous vehicle (AV) companies to assist them in making informed decisions in a complex marketplace. When they first started though, their research was entirely simulation-based limiting their ability to engage with the kinds of questions their customers found most valuable. They needed a way to test this technology on the road. That's when they found PolySync. It's easy to think of self-driving cars as a cohesive unit. In reality, today's autonomous driving stack is an enormously complicated orchestration of distinct products, most of them under constant development. No ideal solution exists across the vast array of available sensors, path-planning applications, and decision-making algorithms. As a result, companies who are interested in working in the AV space can easily get stuck researching where to begin. It became clear to me quite early on that [...] to really do justice to the business we're in, we were going to need to conduct our own applied research. Five years ago Phil Magney, Founder and Principal of VSI Laboratories, recognized that companies would need help negotiating this complex landscape. After 20 years of working as a Senior Director of Automotive for IHS, he left to start VSI Labs. A research firm Magney states is devoted "[to understanding] the building blocks of automated driving—the entire AV stack, from perception to decision, through to control." With the help of VSI's research, Magney hoped to inform the choices made by companies who were trying to navigate the AV market. When VSI began, vehicle platforms for autonomy development were prohibitively expensive. This lead to a significant portion of their work happening in simulation. Magney knew this wasn't going to provide the level of research required to meet the challenges of the market. "It became clear to me quite early on that [...] to do justice to the business we're in, we were going to need to conduct our own applied research," says Magney. On-road testing, he quickly realized, is a necessity. VSI quickly discovered OSCC, PolySync's open-source precursor to DriveKit. OSCC helps engineers develop autonomous vehicle applications by giving them computer control over the vehicle's steering, brake, and throttle systems. It was precisely the platform VSI needed to move forward with their applied research. For Magney, "the lightbulb lit and in my mind [I saw] this as the perfect opportunity for us to take [our work] up a notch." Before long, they had reached out to PolySync and ordered a Kia Soul with OSCC installed. (At the time, PolySync was building development vehicles for select customers with compelling use-cases.) "The day the vehicle arrived it was like Christmas," Magney recalls, "we were off and running." 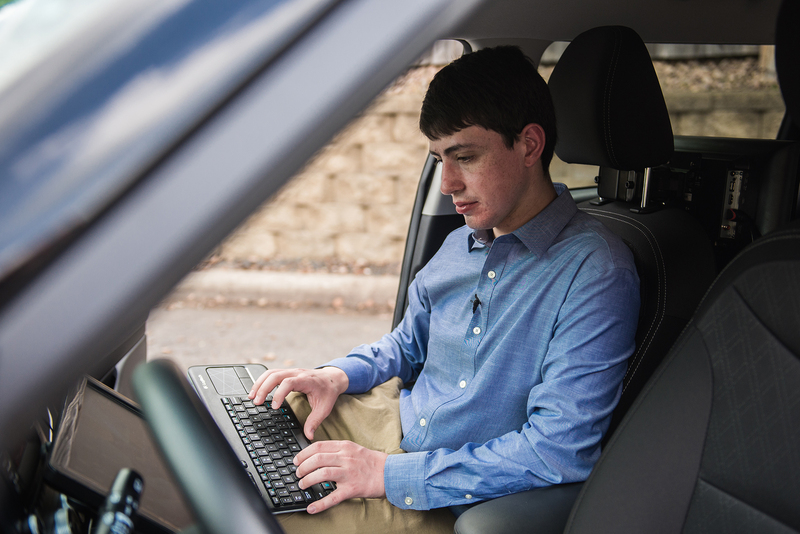 After only a few months with their OSCC-enabled car, they were able to develop basic ADAS features like adaptive cruise control and Active Lane Keeping Assist. Matthew Linder, VSI's Autonomous Solutions Engineer, runs a diagnostic test. Using OSCC, VSI has been able to engage with the market in an entirely new way. "[OSCC] really takes a bit of a load off of VSI, so we don't have to worry about the control systems and just focus on the environmental and behavior modeling," says Magney. OSCC provides them with a by-wire control system that is foundational to their research. In addition to the OSCC system situated in the Kia's glovebox, an array of sensors (lidar, video, millimeter wave radar) are connected to an NVIDIA DRIVE PX2 in the trunk that is responsible for vision processing, decision making, and control message calculation, alongside GPS and IMU units that connect over a standard network router. "At the end of the day," says Magney "we were able to have a cost-effective platform from which we could begin our development." The sophistication of VSI's research program continues to improve with current work focused on precision localization, developing their second generation Level 2+ automated vehicle, and advising Minnesota's Department of Transportation. OSCC continues to act as the cornerstone of their operation, accounting for 90% of their day-to-day tests. Magney sees its successor—DriveKit—as an important contender in the future of advanced AV development, "[DriveKit] is going to help [AV companies] know that they've got a best-in-class solution with which they can begin development." PolySync-enabled vehicle at VSI’s laboratory in St. Louis Park, MN. DriveKit is PolySync's vehicle control interface for advanced testing & development. You can learn more by visiting the website or getting in touch directly.